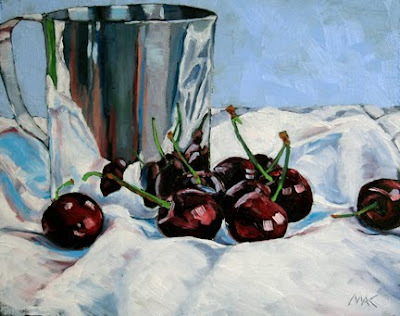 Another in my mini series of cherries and reflections, minus the glass bowl, hence the title. Beautiful job! A still life alive with movement!! I love this. Thank you for your very cool comment! Gorgeous, gorgeous, gorgeous! The cherries are excellent and the reflections in the cup are great! This is outstanding! I am totally inspired to shop for something silver/chrome to paint... Those cherries look amazing.